My shipment from Shapeways arrived on a rainy Friday morning. I thought it was a bit odd when I saw the e-mail notification since postal delivery is typically in the afternoon on weekdays, but when I got home, there was the package. Everything came packaged in padded bubblewrap envelopes, with additional padding to prevent the contents from excessive movement during shipping. The box is huge compared to what was actually being shipped, but it probably helps to prevent fragile parts from being broken in the mail. My impression of the models made with the White Strong & Flexible (WSF) material is mixed. Apparently WSF is Nylon 12 (aka polyamide 12), but it seemed very different from the material that was used to make the Serúdla models that I reviewed a couple of years back. The models seem very light and don't feel particularly robust. I'm guessing that is because they are partially hollow. The material really reminds me of the type of plastic used to make caps for fast food drink cups. The surfaces are very powdery/grainy looking, and edges that should ideally be sharp and smooth are covered with burrs. I tried to smooth the beak of the Quetzalcoatlus with some fine sandpaper, but it just made the burrs worse. Perhaps some Mr. Surfacer will work to make the surfaces smooth, but I'd be open to suggestions from anyone with any experience polishing this material. From a foot away, I'd say that the models look really good. The contours and poses are all top notch. However, close up they really look like rapid prototypes. My son examined the models a bit, and commented that they looked like "outlines" rather than detailed models. The fine details of the mouth and eyes of the creatures are very soft or non-existant. 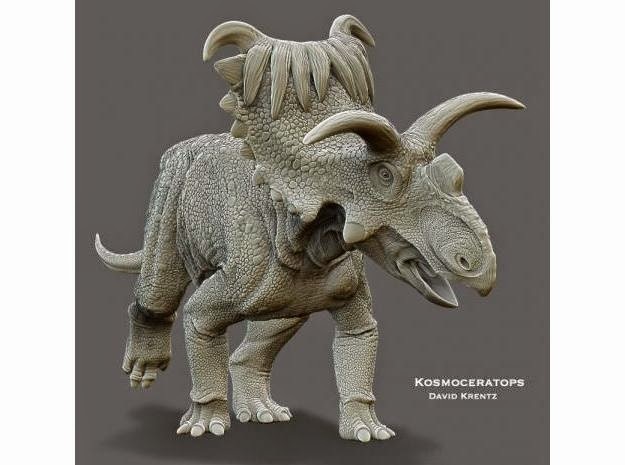 Here is a comparison of details from a Krentz resin styracosaurus and the WSF kosmosaurus. Most of the skin texture that you see on the 3D render is lost in the print. Even so, I'm always impressed by the fine digits that are possible with 3D printing. I won't go into the models made with FUD , but they look pretty fantastic. It's just that they're tiny, and the material is really hard to photograph in its natural state. I should have ordered one each of the WSF models in FUD to do a true comparison, but ordering another model at twice the cost didn't seem like it was worth it to me at the time. However, now that I think about it, in monetary terms, the FUD version of a Krentz model is still probably only ⅔ of the price of a comparable model in resin. 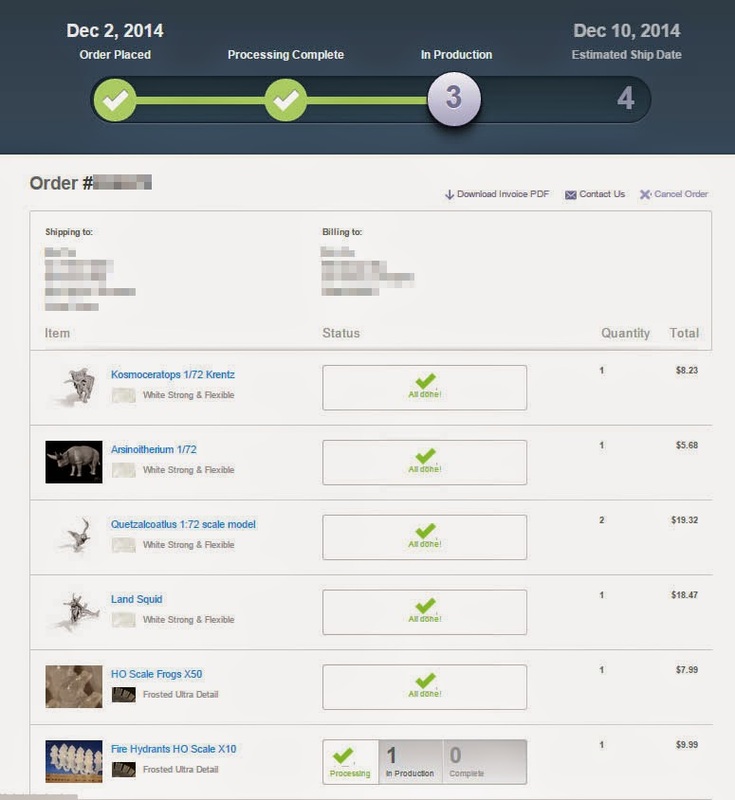 In addition to the Shapeways models, I had also purchased 3D printed elephant and mammoth models from an eBay seller. These models were made with ABS, which feels a lot more sturdy than WSF. Layer lines are clearly visible on the models. The underside surfaces have an odd fingerprint-like pattern to them. The nice thing about ABS however is that it can be polished. Sanding is one option, but acetone vapor treatment also seems to work wonders. I will try this out and post about it at a later date. In conclusion, my thoughts are that WSF is good for models that do not have delicate surface details or require hard edges. There could probably be a good market for sculpting dollies made with WSF. In the future, I'll go with FUD when ordering models. However, I don't really see myself ordering many models for the moment, because the price point seems rather high. WSF is heatproof to 80℃ / 176℉ and has a melting point at 172℃-180℃ (I wish I had known this when I was modifying my Serúdla). Additional specs can be found in the MDS. 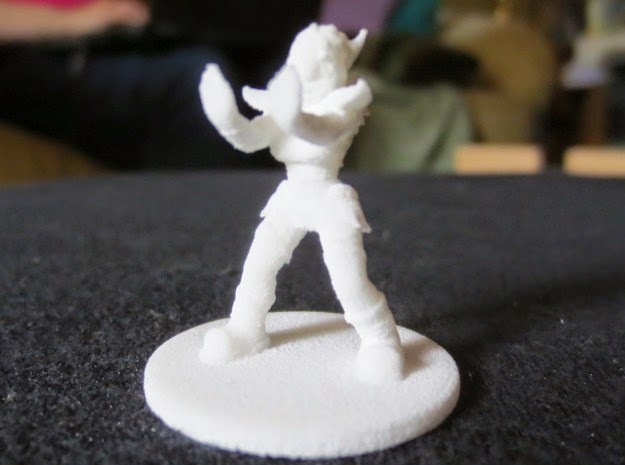 A tutorial found at Shapeways recommends CA glue or Araldite epoxy resin for gluing Nylon 12. I also found additional information about bonding Nylon at RELTEK. Frosted Ultra Detail (FUD) is some sort of acrylic polymer. Specs can be found in the MDS. 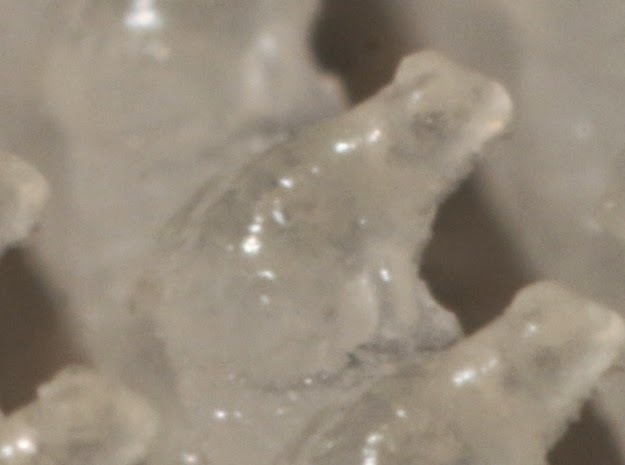 The layer lines on ABS models can be smoothed out using acetone vapor. There are a number of tutorials that can be found online, but the method that I plan on using will probably be similar to the one described in this Airwolf 3D video tutorial. I like this method because I don't particularly want to be working with fire and acetone at the same time, as described in many other videos. Having the liquid acetone above the the model (but not dripping onto the model) also makes a lot of sense, since acetone vapor is heavier than air. 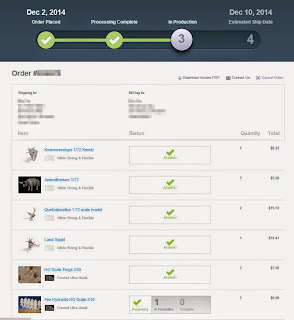 I've always balked at the cost of the models, but I finally placed my first order to Shapeways when they had their Cyber Monday promotion. I like the fact that they give you an estimate of when the models will ship, and that you can check the status of the order to see which step they are on in the production process. Being cheap, I chose the White Strong & Flexible (WSF) printing material, except where it was not an option. Human sized 1/72 figures look very grainy with WSF, but I hope the larger figures that I purchased will look better. 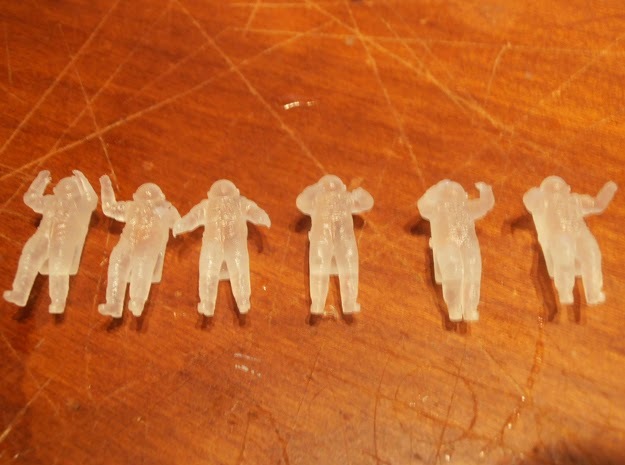 The 1/72 figures printed with Frosted Ultra Detail (FUD) look pretty amazing though. I'm hoping the models will arrive later this week so I can post a review over the weekend. I've turned off comment moderation since word verification seems to be the default setting for Blogger now. After a couple of months of inactivity on the hobby front, I was able to spend the Thanksgiving holiday finishing up a couple of miniatures. 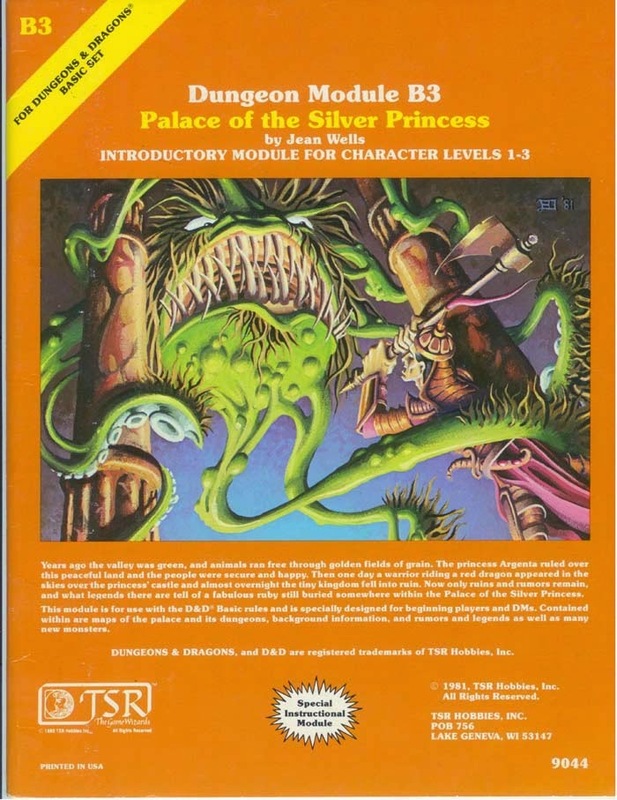 The first job was elevating the Pathfinder Paeta to being Queen of the Demonweb Pits. 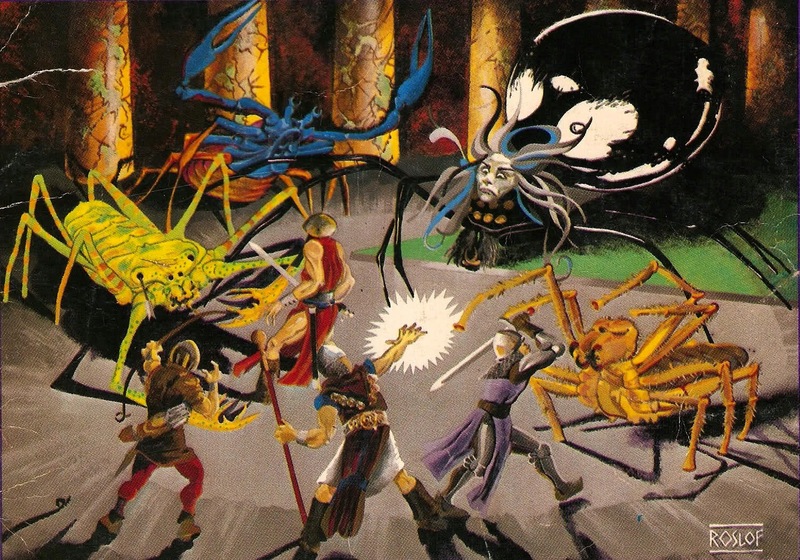 I wasn't able to find out much about what or who Paeta is, but she seems to be somehow related to phase spiders. The legs on my Paeta figure were all bent and distorted, so I had to clip them off and pin them so that she could stand up properly. Unfortunately the plastic that the figure is made out of is not very strong, so the legs will sag if she is kept free standing for long periods of time (or if the temperature is too high). 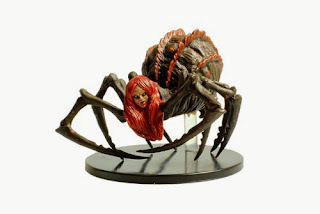 I thought that she would make a good representation of Lloth, since I am of the same opinion as Shandar the Ashen One regarding Llolth's current depiction as a drider. 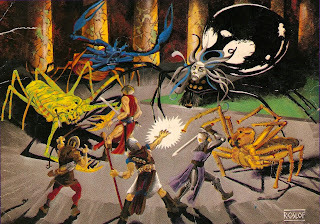 I repainted her face using Jim Roslof's illustration from the cover of AD&D Module Q1 as inspiration. Now I'll need to find some solifugids and pedipalps to back her up. The second figure I completed is a decapus, modeled after the Erol Otus art for the cover of D&D Module B3. Because of this picture, I've always thought of the decapus as a kind of plant creature. The tentacles that split and rejoin reminded me a lot of the banyan tree, while the spines on its body reminded me a lot of the spines on the rambutan fruit. 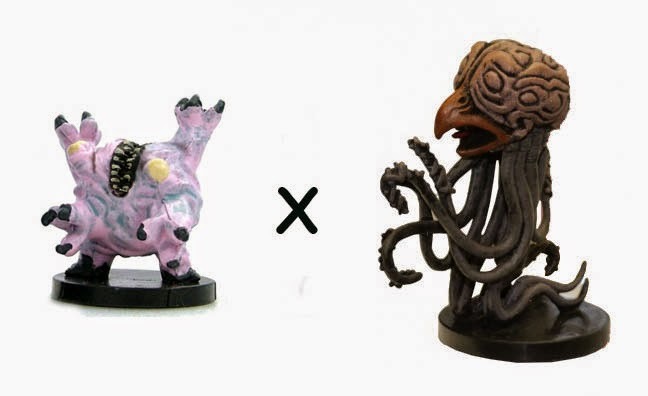 I cobbled the figure together using a grell and an abyssal maw from the D&D Miniatures line. I chopped off the legs and extra eyes from the abyssal maw, and used the body as the basis of the decapus. The tentacles were removed from the grell, reshaped a bit with a hair dryer, and then pinned to the body. The spines on its body were made out of stretched sprue that I bent and glued into holes drilled into the body. The attachment points were then sealed with J-B Weld. I added splitting and rejoining tendrils using round cross sectioned plastic twist ties. I shaved off some of the plastic at each end of a section to expose the wire, and then glued them into holes drilled into the tentacles. The ties were then slathered with J-B Weld. I built up some more ropiness to the tentacles with J-B Weld, and after the epoxy dried, I painted the miniature. The eyes bulge out unlike the decapus of the Otus picture, but I think it makes the creature look more plant-like this way. "...suppose this war just goes on and on and on and destroys everything in the world. 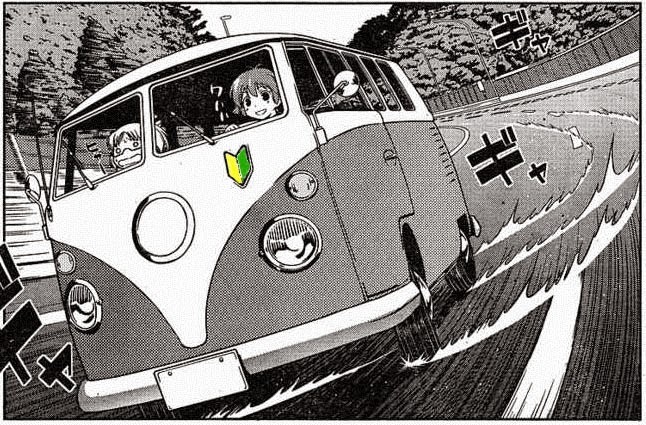 Well, since the Volkswagen can get along without water, she’s bound to survive when other creatures die off! Someday the world is going to be populated with nothing but Volkswagens!" 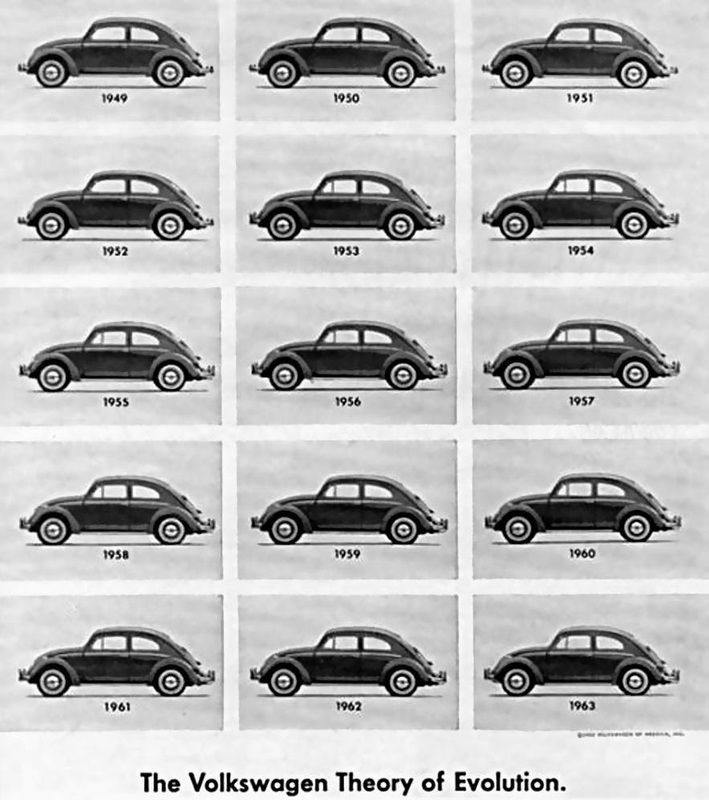 The design of the iconic VW Beetle (aka Volkswagen Type 1) is often claimed to have been significantly influenced by Adolf Hitler (for whatever reason), but Ferdinand Porche was more likely inspired by other sources (particularly Tatra, and allegedly by Joseph Ganz). 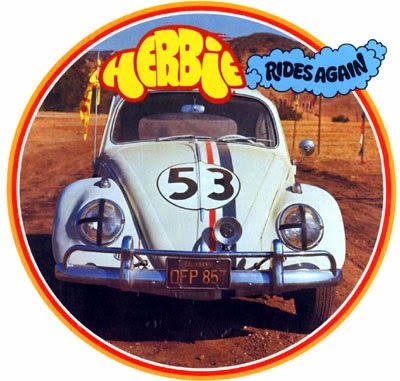 Eventually, the car that personified Kraft durch Freude became inextricably associated with the hippy movement. 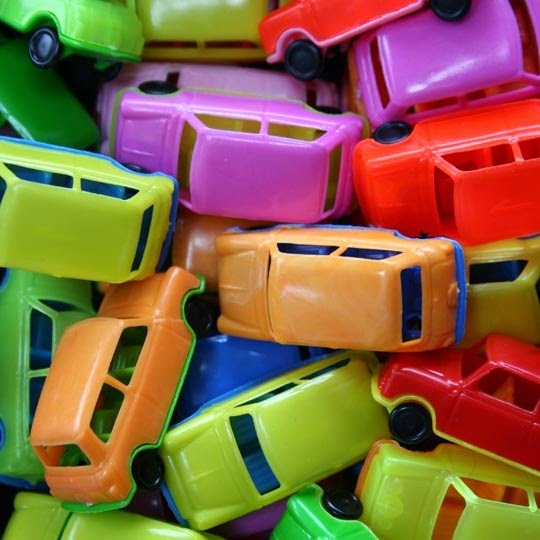 In the 1/72 world, VWs are primarily diecast models. The most commonly encountered models are produced by Hongwell (also repackaged by Schuco). Two different models were produced by Hongwell. From real life experience with a red VW like the first version of the Hongwell model, I could tell that it was too big. In fact, it measures out to about 1/67 scale. Their second version scales out exactly to 1/72 scale. If you see these models on eBay, the best way to tell the difference between them is to look at the side windows. For the cabriolet version, the shape of the canvas top is also different. On the other end of the spectrum is the plastic VW Maggiolino 1200 manufactured for PEZ by the now defunct CGGC Grisoni. The model is marked as being 1/72, but despite what it says, the car is more like 1/87 scale. Other cars in the series which may-or-may-not-be 1/72 include the Fiat 500 and Mini Cooper. 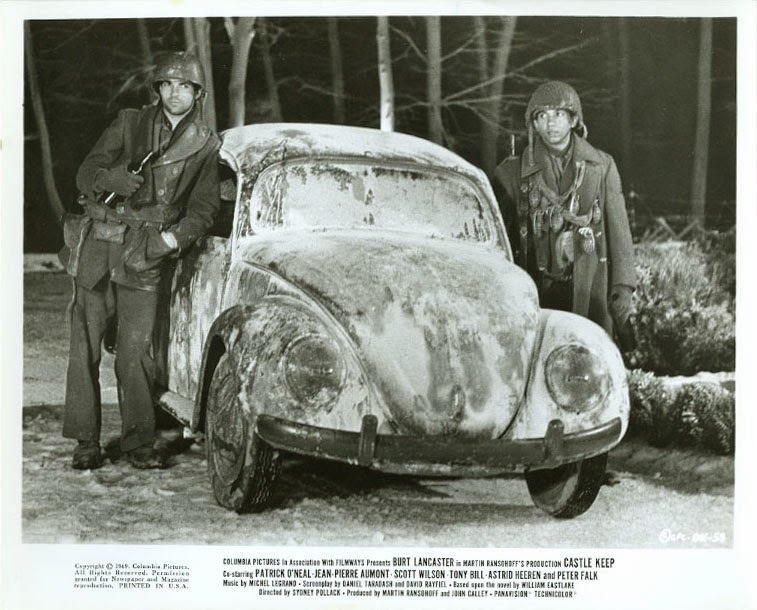 Real-X/Epoch also makes a good 1/72 scale VW, and Oxford makes a 1/76 version of the 1958-1964 VW. The Epoch and Hongwell cars are made from different molds, and may represent different models of the Beetle. Hongwell also makes a version of the Beetle with Herbie markings, but it is a repaint, so represents the wrong model year of the car. 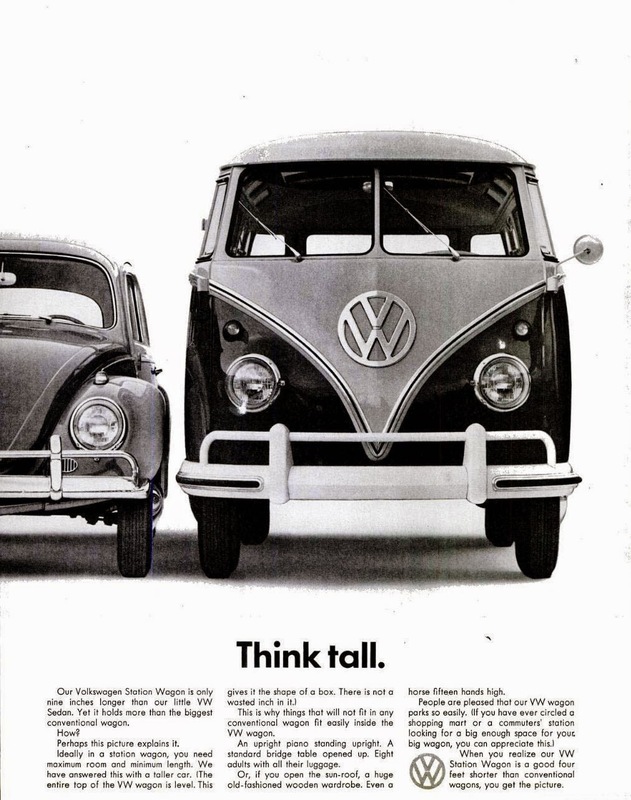 Following up on the success of the Beetle, Volkswagen introduced their van (Volkswagen Type 2) in 1950. A 1/72 version is made by Hongwell. 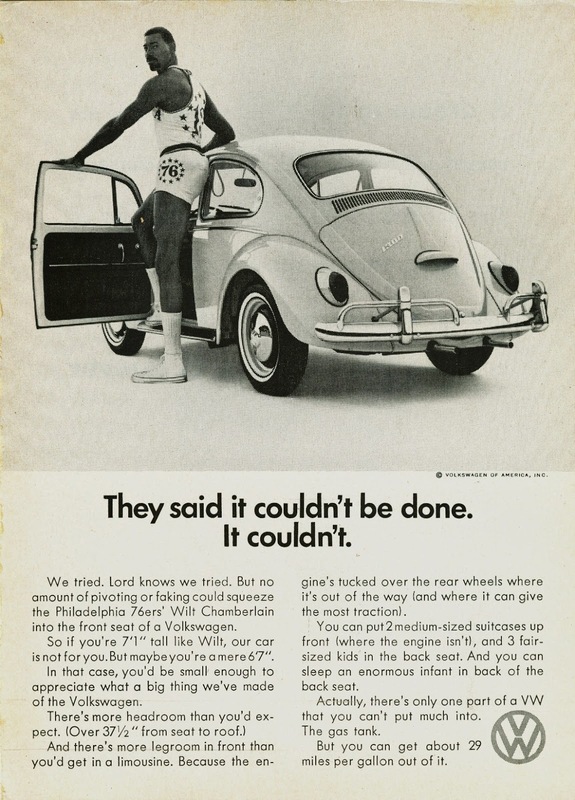 The wheelbase is identical to the Beetle, which is as it should be. I think that the body may be a bit too short, but it looks good overall. I saw the yellow-and-green marking in the picture below on a car driving on the road. Does anyone recognize what it is?